West’s Hapkido Academy, Inc. opened its doors in 1973 in Jackson, Mississippi when GM J.R.West, then a HapKiDo 3rd Dan, decided that it was time to begin to pass on the knowledge that he had acquired during his contact with the Korean Tiger Division (ROK Capital Cavalry) while serving an extended tour as a communications specialist in Binh Dinh Province in the Central Highlands of South Vietnam. HapKiDo was virtually an unknown art in United States in May of 1970 when GM West, a HapKiDo black belt since 1967, returned from Vietnam. After searching the southeastern United States he was fortunate enough to become associated with Master (now Doctor) He-Young Kimm (Kim, Hyung-suk), an extremely well educated and talented man with an incredible knowledge of Korean Martial Arts including, among others, Hapkido and Yudo. The two began a friendship in the 1970s which continues to this day, with GM West, until 1996, serving as the director of associate members for Dr. Kimm’s World HanMuDo Association, and Dr. Kimm teaching clinics regularly at West’s Hapkido Academy as well as acting as GM West’s friend, mentor and advisor. In 1989 GM West married Renee Sebren (1961 – 2003), a former student who had attained 1st gup at West’s HapKiDo Academy prior to moving to Colorado in the early ’80s. GM West has continued to strive to expand the knowledge and ability of all HapKiDo practitioners with whom they have come in contact. Master Renee West, although now deceased, served as an example to female Martial artists everywhere that they too, can be as good as they want to be. In 1996. 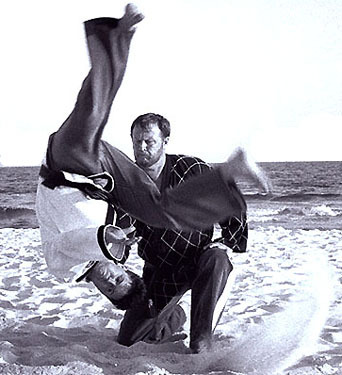 Dr. Kimm wrote a Letter of Recommendation for GM West stating that the time had come for GM West to “take his place as a completely independent leader in the field of HapKiDo”. Today the academy maintains a 5,250 sq. ft. modern facility totally dedicated to the teaching of HapKiDo to men and women in the Jackson suburb of Ridgeland, Mississippi, and offers the utmost in traditional HapKiDo instruction for those who are more interested in learning than they are in the color of their belt. Every Spring and Fall, HapKiDo stylists from all over the world make the trip to Jackson, Mississippi to train at one of Master West’s International HapKiDo Seminars which continue to break all records for numbers in attendance and distance traveled.